Today at 5 PM Eastern I will join Al Kresta to discuss St. Mark the Evangelist who wrote the Gospel of Mark. He is not discussed much but is a fascinating character. Tomorrow morning at 9:15 AM I will join Teresa Tomeo to discuss St. Mark as well but from a different perspective. It is great fun to discuss these biblical characters while in the Holy City of Jerusalem where they LIVED. I am looking out my window now at the dome of the Holy Sepulchre. You can listen to both of these shows on-line at www.AveMariaRadio.net. A few days ago I gave written interview to Lauren Abdel-Razzaq of the Detroit News on the question of Catholic supporters of “gay marriage” approaching for holy Communion. Abdel-Razzaq quoted me accurately if not quite as precisely as I wrote and I’ve no complaints about the use she made of my remarks. I would note, though, that my remarks were, of course, offered in more detail than could have been accommodated in a secular news story and so, on the chance that some readers might like see to my longer comments, I am happy to provide them below. 1. A-R asked how I felt about the backlash that has come about because of the comments you and Archbishop Vigneron made regarding gay marriage. First, I would prefer to use the word “reaction”, for to call it a “backlash” implies that the reactions are wholly negative. Some reactions have been negative, certainly, but many have been positive. Mostly, the positive responses are grateful for the clarity that I bring to the more technical aspects of Church law and appreciative of the obvious care toward one’s spiritual well-being that the archbishop expresses. Church teaching on, say, the nature of marriage, on the licit expression of sexual pleasure in marriage, on the obligations of Catholics to act in accord with their identity as Catholics, and so on, is very, very old. What’s new in all this, at least for many, is hearing such points made succinctly and consistently even in the face of strong opposition. It helps to keep in mind that, as a canon lawyer and professor, the only “authority” I speak with is the authority of the sources I cite, for example, magisterial documents, canon law, and so on. Either my use of these materials is accurate, or it’s not; I’m content to give people references to the positions I defend and to let them assess for themselves my fidelity in relating those sources. Bishops, however, speak out of something much deeper than documents, they speak out of the living tradition of the Church. While my goal is largely limited to making sure that Church discipline is correctly understood by those concerned, bishops strive to encourage the incorporation of Church teaching into the lives of the faithful. That’s a much harder task. Why? Because Catholicism is not simply an impressive set of academic propositions; it’s a path through life toward happiness with God. And that’s what bishops ultimately must care about. 2. A-R indicated that I had addressed “gay marriage supporters, not just LGBT individuals” in regard to holy Communion. Close. I did not address LGBT persons per se, but rather, I stated that active support or promotion for redefining marriage (no matter who is doing the promoting) is to act contrary to the settled teachings of the Catholic Church on marriage. Catholics who engage in such public advocacy seriously damage their communion with the Church and should refrain from approaching for holy Communion. I also said that, depending on circumstances, such public advocacy might result in Communion needing to be withheld from activists, but I did not try to assess any specific cases, nor did the archbishop even raise that topic. He was talking about the personal responsibilities of Catholics in taking holy Communion, not about the obligations of ministers in administrating it. It’s a related issue, but quite a distinct one, and one easily overlooked in conversations. 3. A-R asked whether the church needed to forge relationships with those who practice the faith rather than try to push people away? I would agree. Of course, what one means by phrases like “forge relationships” and even “the faith” seem open to misconstrual, no? 4. A-R asked whether I was concerned about alienating Catholics, particularly those who may have children or family members that are gay? Sure, but again, that simply forces questions as what, for example, “alienating” means. I am mostly concerned that people have an accurate understanding of what Church tradition and law expect of Catholics. No one seriously thinks, of course, that Church law has an answer to every question in Church life, let alone for civil society; nevertheless Church law, and the teachings it rests upon, does have lots of good answers to lots of important questions, answers that too often go unexplored because people are simply unaware of them. 5. A-R noted that New York’s Cardinal Dolan has spoken about not wanting to turn the defense of marriage into an attack against gay people and asked whether I thought that was possible. Today was a wonderful day full of grace and adventure. The Bible comes alive in the Holy Land. This is why we call Israel the 5th Gospel. Started out with a boat ride across the Sea of Galilee to view the 2,000 year old “Jesus Boat” before arriving in the city of Jesus for Mass. What is the city of Jesus? It is Capernaum where he lived for the three years of his earthly ministry. I gave my talk “Defending the Eucharist” and we visited the synagogue where Jesus said, “Eat My Flesh and Drink My Blood.” It is one of my favorite places in the Holy Land. 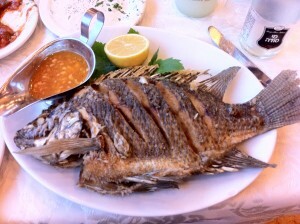 Lunch was St. Peter’s Fish with the head on! It is the same fish eaten by Jesus and his disciples on a daily basis. On the two hour drive up (south) to Galilee I told my conversion story from Baptist to Catholic. I never tire of telling this story. We arrived at the Church of the Visitation and I explained why Mary is the Ark of the New Covenant. We arrived at our hotel in Jerusalem, got checked in, had a great dinner and many people went out for a walk through the Old City of Jerusalem. We are all ready for a busy day tomorrow – all day in Bethlehem.